We all say this, every single day. Chances are, our children have heard this word a million times. But do they know what it means? Do they really understand why we use it? But again, to a child, what does this mean? What does this look like in daily life? Normally, we use Alhamdulillah when we are grateful for something. When we finish eating – Alhamdulillah. We are grateful to Allah for this food. When we are asked how we are doing – Alhamdulillah. We are grateful to Allah for our health. We are grateful to Allah for His many blessings to us. To be ACTIVELY grateful, however, needs to be taught and instilled in our children. One way that we can do this is to discuss with our kids things that we are grateful for, and then have a list that is easily accessible. You can display the raindrops on a wall, with each thing to be grateful for on each raindrop, so that it is easily visible. You can also punch holes in the raindrops, and place it in a ring or tie it together in book format. 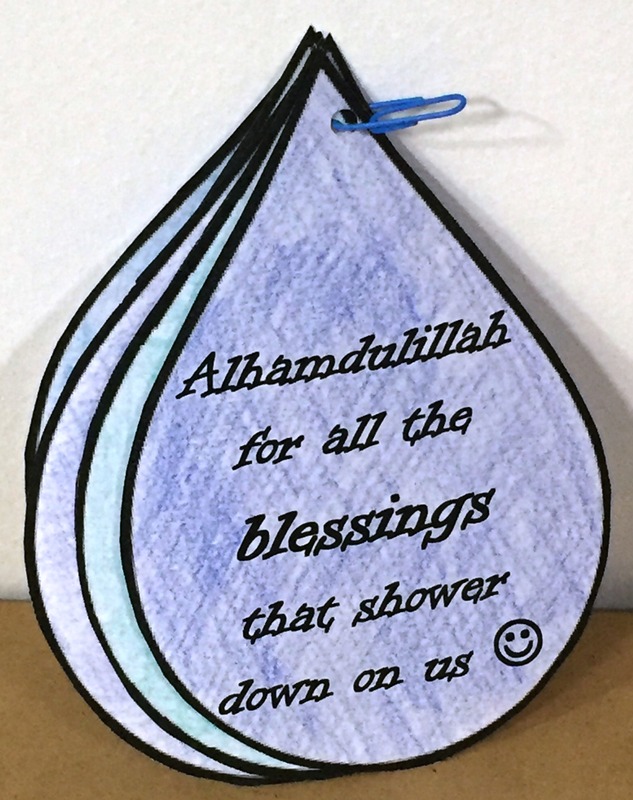 As you start a discussion with your children about Allah’s blessings, it might be a new concept depending on the age of the child, so you might have to start them off with a few examples. However, once they understand the concept, they’ll come up with examples of their own. 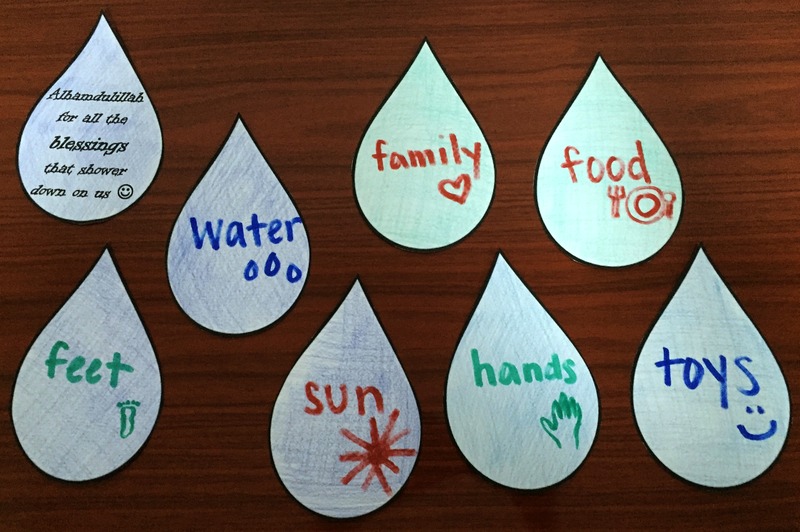 In each raindrop, write down the ideas they come up, the things that they are grateful for. Of course, you’ll have to consider the ages-younger children will need pictures and an adult hand for the writing. Older kids can write it themselves. You can start small – maybe a list of five for the first day. The next day, take a couple minutes to go over the ideas from the previous day, and see if they have any more to add. Make it a daily practice, maybe right before bed, and try to add an idea every day. It’ll take just a few minutes. Before long, you will have quite a list. I hope this has inspired you to be grateful daily, and to teach our kids to be grateful as well. If you enjoyed this, please share this post on Facebook, and please like the page as well – a link is below! Tell me what you think about this idea below in the comments, and especially let me know if you tried it out!